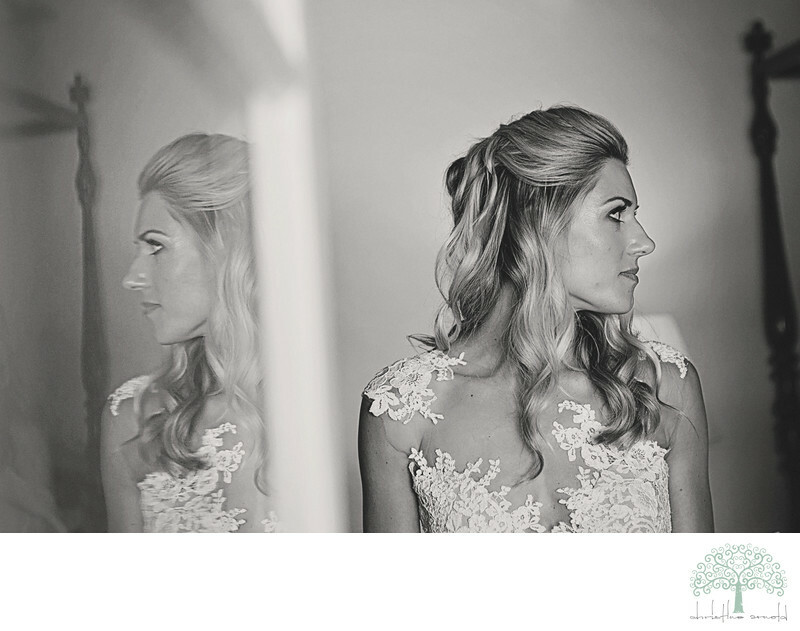 Amy is such a stunning woman, as she was busy getting ready for her wedding at Colony Palms Hotel in Palm Springs, I noticed the french doors leading out to the balcony... at certain times it offered the perfect reflection. so once Amy had finished all of her hair and makeup and her bridesmaids had finished buttoning up her dress, I asked amy to stand in the doorway and then just moved the door to the right angle and voila!! Placing my subject in the doorway not only offered the perfect angle for the reflection shot I was looking for, it also put her in the most spectacular light, not direct sunlight, but filtered and soft and so SO flattering. I made the image black and white to really focus on Amy's flawless beauty. Her skin is magnificent and her hair and makeup simply helped accentuate that... along with her stunning dress to frame her face, I think we made a timeless portrait with a modern twist. Location: 572 N Indian Canyon Dr, Palm Springs, CA 92262. Keywords: Boutique Hotel (3), California (66), Coachella (3), Colony Palms photographer (9), Palm Springs (84), Wedding photographer (33), Wedding photography (45).